Can Chickens and Ducks Live in the Same Coop or Barn? Can ducks and chickens live together in the same coop or barn? 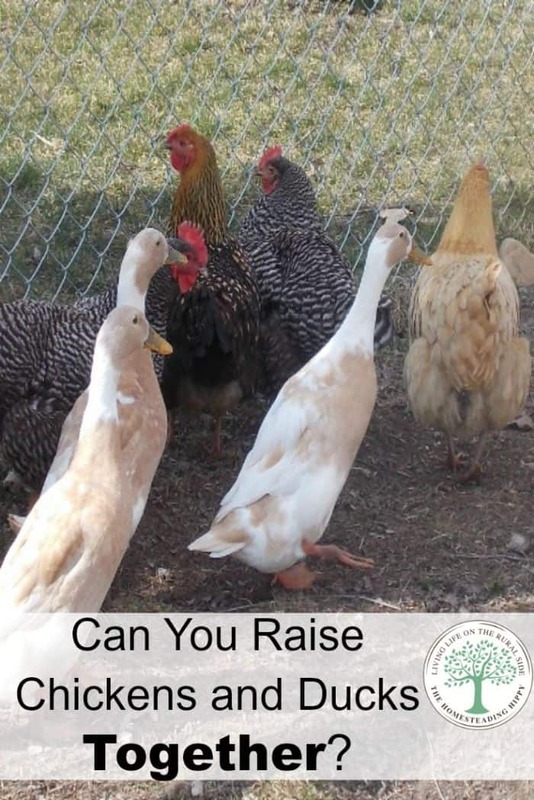 This is a commonly asked question for homesteaders, and a very valid one.There are a lot of different opinions on this, so the answer is necessarily black and white. Chickens and ducks have enough differences that housing the separately would be ideal in many cases. But, what if you don’t have the room? First, it would be best to brood ducks and chickens separate if you can. if you are NOT able to (we usually can’t due to space) then there are some things to remember. Ducklings like water and to play in the water. Chicks, not so much. Ducklings can splash water everywhere in the brooder that gets the bedding and chicks soaked. To keep them both safe and happy, add just a regular chick waterer to the brooder. The ducks will get enough to drink from it. We also took our ducks out regularly and let them play in the tub with a pie pan full of water daily for about an hour or so. They were happy with that. In the wild, a mother duck will put oil on the ducklings feathers that allow them to float in the water. Since they are not wild, and I am not a mother duck, placing ducklings in deep water for long periods of time can actually cause them to get soaked and even drown. If you brood them separately, when introducing ducks to chickens, it’s best to do it at night when the chickens have roosted. When they are sleeping, they don’t notice “strangers” being added to their coop and run as quickly. This helps them blend into one flock together easier. Ducks and chickens WILL play together nicely, eventually. Do ducks and chickens eat the same food? Not always. Chick starter also can contain anti Coccosidistats. This is often added to help prevent Coccidiosis, which is a parasite that can damage the gut of chickens. Ducks can easily overdose on the added medication and die. We actually do not feed our chicks or ducklings any medicated feed to avoid this. I haven’t ever had an issue with Coccidiosis myself. If you choose to use medicated feed, you need to keep an eye on how much the ducklings are eating, or feed them separately. Once ducks and chickens are fully grown, they can all go on the same flock feed regardless. Chickens can get cranky and bully ducks. Keeping 1 duck with chickens can exaggerate this, too. I have seen this happen more often when there is one or two ducks facing off to 6-10 chickens. They can learn to get along, and usually the ducks will fight back after a while, too. If possible, keep the number ratio of ducks and chickens as close as possible. Or at least make sure they have enough room to get away from each other. Chickens will put themselves to bed at night, but ducks not so much. We had to train our ducks to go into the coop at night, even during the winter. They like to sleep near their water or IN their water if they can. In the wild, that’s where they would go to get away from predators. It took us about a month to get it through their heads they needed to go into the coop at night, and during the summer we have to remind them again, since they like to go for nighttime swims. I live in town, and predators aren’t much of an issue, but if you have lots of them around, you will want to make sure they are secure each night. 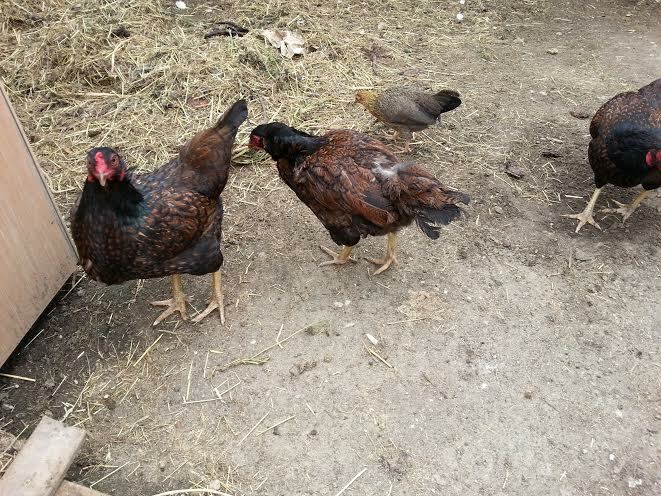 For ideas on a dual chicken and duck coop, read the post here. So, with a little bit of forethought, ducks and chickens CAN live together successfully. Do you raise both together? What are YOUR thoughts on this? Be sure to pin this to your favorite board for later. Good article and great practical advice. I raise chickens and ducks together and found your comments spot on. I find that since the ducks sleep on the coop floor and the chickens roost above, there is plenty of room in the coop. The one thing I might add which you touched on for anyone thinking of ducks is that, ducks are MESSY if you raise them right. Because they need deep enough water to at least dunk their heads into to keep their nostrils clean, there must be open water sources. I use buckets as they can’t get enough of their bills into chicken waterers. They also need water to swim in as it keeps their feathers and body in condition. I do not have a pond, but use plastic wading pools. Even in winter (I’m in Zone 5b) they will happily swim once or twice a week. A couple winters ago we had deep snow and I loved how they “swam” through the powder. I actually shoveled out a path for the chickens, but the ducks loved the snow! Thanks for your practical and “real” information. I find a lot of blogs are just too slick and glossy for me, but yours is true life on a small homestead. Keep up the good work. I love the idea of ducks swimming through the snow… how fun to watch! Thanks for your kind comments, I am so glad you are here! My ducks and chickens get along fairly well. Love watching all their antics.